a creamy vanilla I hadn’t bargained for. “What is THIS?” I said out loud to myself. But the kids were painting the living room and it was cold and we were all getting hungry so into the pot of Happy Herbivore Vegan Sweet Potato Dal and the pan of fries its pale vanilla innards went. Talk about a happy accident!! The pale vanilla starch cooks up golden and luscious and filling and sweet. A bit more substantial than than its orange sister. I love these baked, slow cooked, cubed and steamed with just about anything. 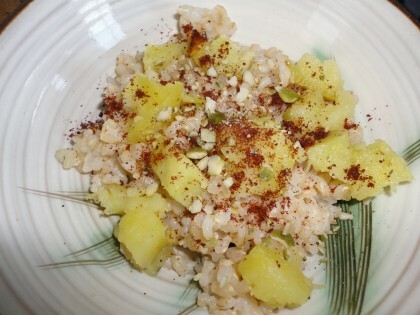 One of my starchy “desserts” is some resteamed brown rice and Japanese sweet potato cubes sprinkled with cloves, and maybe a dash of ground pumpkins seeds. What a lovely, aromatic and filling “starch bowl” on a cold night. There they are, under the ground flax and next to the tomatoes. But the way Japanese Sweet Potatoes came to the rescue most recently was when I really wanted to find a way to make Susan’s Massaged Kale Salad with Sweet Potatoes and Pumpkin Seed Dressing. Who wants to miss out on that party? But I needed to find a way to make that lovely dressing soy free. I needed a substitute that would approximate the heft and texture of the tofu-cashew mayo, yet go well with the taste of the pumpkin seeds. I looked at a hunk of baked Japanese Sweet Potato I had out on the counter to cube into something, and my prayer was answered. Here’s how I made Susan dressing soy free. To replace the saltiness of the miso (which I shouldn’t eat if it’s soy based) and the spice of the jalapeno (which I didn’t have on hand, and which I admit I’m kind of wimpy about anyway) I added a tablespoon of tomatillo salsa and a little smoked paprika. 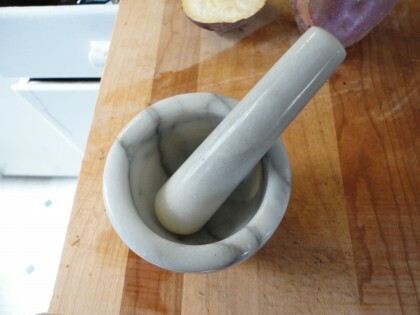 I roasted extra whole cumin seeds in a little pan, then ground them up with my mortar and pestle. 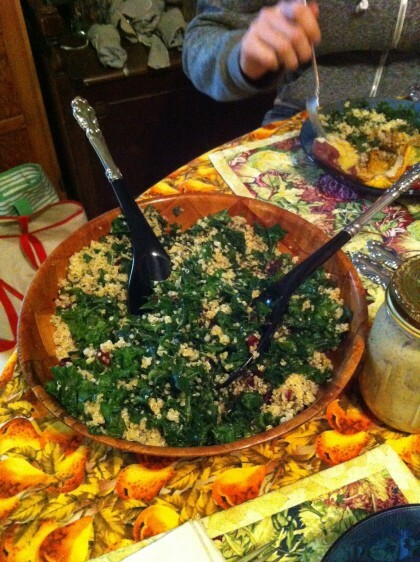 At Thanksgiving we massaged lots of kale with this Japanese sweet potato version of Susan’s pumpkin seed dressing. Then we combined it with an oil free and cashew free version of a simple salad our co-op deli serves: quinoa, lemon juice, coconut aminos, dried cranberries, chopped parsley and chopped mint. It was festive and delicious. I’ve often found in my writing life that some of the best lines I’ve written in poems end up being the result of an unintentional typo. Such as “tin evening air” sounding way better to me and more interesting as an image than “thin evening air.” I guess the same holds true for shopping without my glasses. At least last Winter. I got lucky enough to discover a new best friend from the sweet potato family. If these are new to you, and you can find them among the array of sweet potatoes displayed for holiday eating, I hope you enjoy sharing the happy accident love! do you drink coffee or tea? what about alcohol? I don’t drink coffee. Haven’t since probably 1998. I do drink herbal teas. Very occasionally very weak green tea. On rare occasions I will have a ceremonial a few sips of wine or beer or a cordial. I never make it through the whole glass. That sounds amazing Maria! 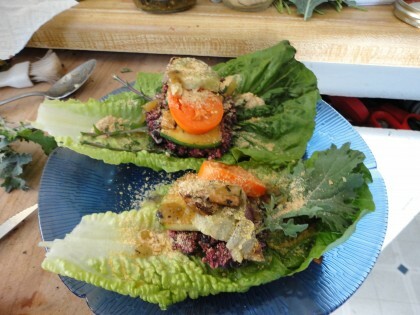 I have wanted to make the massaged kale salad too but couldn’t figure out what to use for the mayo. Thank you! 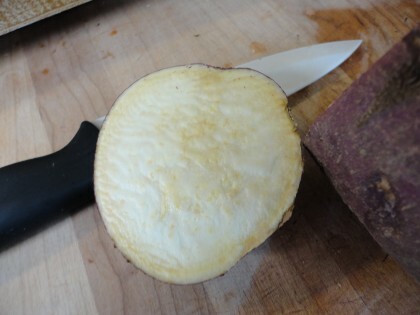 The first time I ever ate a satsumaimo (the Japanese sweet potato) was 7 years ago while in Japan for the first time. Having missed familiar foods from home it was so wonderful to experience the sweet goodness that makes the satsumaimo so special. Wherever you are in Japan you can find a street vendor roasting these beauties, just waiting for you to wander over and buy one to enjoy as you walk down the street. I always catch the smell of them roasting first and then go in search of it. Ever since that first taste 7 years ago I have been hooked! 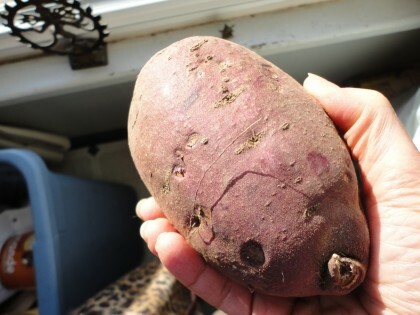 I loved the new things about Japanese Sweet Potatoes I learned from your comment, including their Japanese name, satsumaimo. You put me right there on the street with the vendors and the sweet smell of them roasting. Thank you!! Marie, I love kale, but but is the massage process, please let me know, I just can’t imagine it! 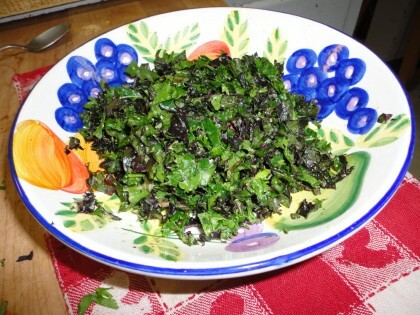 You can read all about what massaged kale is and how to proceed if you click on this link to Susan’s great recipe, Massaged Kale and Sweet Potato Salad with Pumpkin Seed Dressing My adaptation is based on her original recipe and directions. You will also get some laughs in the process of learning from her wonderful recipe. Enjoy! I love reading your posts. You are so kind to share your experiences. Just thought I’d add a note about massaged kale. I use kale regularly as a salad green. 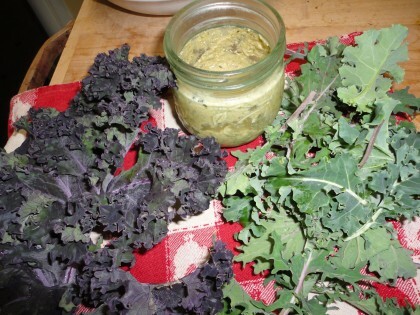 I massage the leaves before I tear them up and I don’t add any dressing while massaging, just the dry kale leaves. Works great. 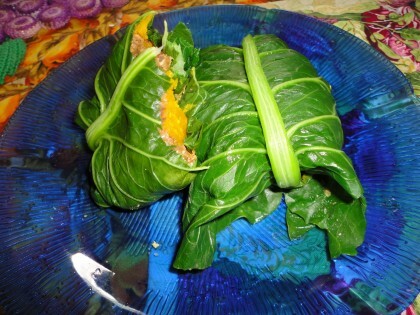 I just pull the steam and discard it, roll up the leaf and massage-away. 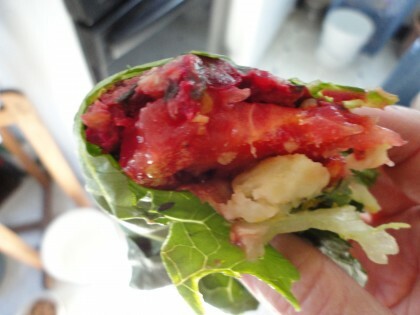 Then unroll and wad the leaf and massage. Working from the whole leaf it doesn’t take very long to bring out the sweetness. Thank you! So glad you are reading along. And thanks for this wonderful note about massaging kale without dressing. What a great technique to try. I have done it with only a little lime juice or raspberry vinegar. I love to learn new things. YES! Exactly. 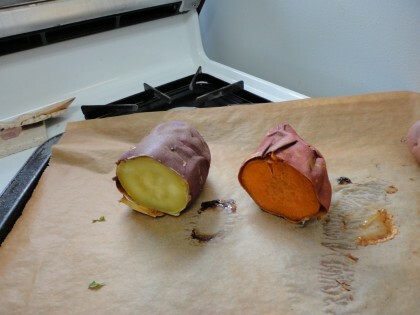 LOVE these sweet potatoes too. Sometimes I eat one every day. How I missed this I am not sure, but yes! I love japanese sweet potatoes. Your recipes look woverful.